Part IV. 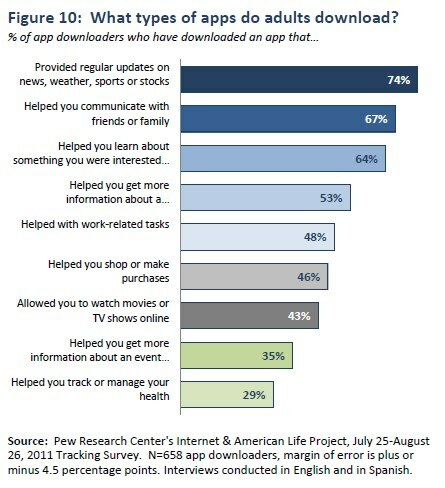 What types of apps are adults downloading? Apps serve many functions, from communication to information gathering, productivity and entertainment. The current survey asked app downloaders if they had ever downloaded apps for any of nine different purposes. Overall, apps that provide regular updates about everyday information (news, weather, sports, or stocks) and those that help people communicate are the most commonly downloaded. Health apps are of particular interest to those in the public health and epidemiology arenas, and Pew Internet has been measuring use of these apps for more than a year. In September 2010, data showed that 9% of all adult cell users had an app that “helped them track or manage their health.” This captures a wide range of software applications, from those that count calories and help manage an exercise routine, to more advanced apps that monitor vital signs and help individuals manage serious health conditions. In 2010, cell users who reported having health apps on their phones were disproportionately young, African-American, and living in urban areas. Specifically, 15% of cell phone users age 18-29 reported having mobile health apps, compared with 8% of cell users ages 30-49. And while 15% of African-American cell users had a health app on their phone, the same was true of just 7% of white and 11% of Latino cell phone users. In August 2011, the question was asked of adults who have downloaded an app to a cell phone or tablet computer, rather than all cell phone users. 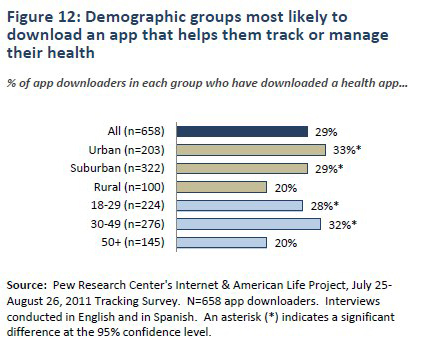 More than a quarter of this population (29%) report downloading a health app. Looking just at adults who download apps to a cell phone, this translates to 11% of all adult cell phone users having downloaded an app that helps them manage their health, a statistically insignificant difference from the 9% of adult cell users who reported having a mobile health app in September 2010. 2011 results are also similar in the sense that adults living in urban areas are most likely to report downloading an app that helps them track or manage their health. And again, younger adults are more likely than older adults to download this type of app; however, in the current survey, 30-49 year-olds are as likely as 18-29 year-olds to download a health app. It is only adults age 50 and older who lag behind. Also, in August 2011, there are no significant differences across racial/ethnic groups where downloading health apps is concerned. Nielsen also finds that downloaders are more willing to pay for game apps than other category. Among their sample of app downloaders, 93% said they are willing to pay for the games they play. Large percentages of downloaders also said they were willing to pay for entertainment apps (87%), productivity apps (84%), maps/navigation/search apps (84%), food apps (77%) and news apps (76%). Part III. Do people use the apps they download?